Their big bloody adventure just became a family unfair. 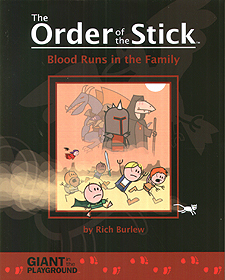 The Order of the Stick: Blood Runs in the Family brings the titular band of heroes to a strange desert land where hidden family secrets await. We're not going to tell you what they are, because they're secrets. I mean, seriously. But they're pretty great, at least if you're a fan of Rich Burlew's record-smashing fantasy-comedy-action-drama webcomic, The Order of the Stick. Thrill as Roy and the gang face reptilian bounty hunters, mysterious death priests, dinosaur-riding soldiers, and a little something we like to call "personal responsibility" as they brave the elements in the fifth book in the bewilderingly popular stick figure saga.